« Celebrate National Hot Tea Month With Pacific Merchants! Here at Pacific Merchants, we’re a bit like school children on Valentine’s Day. We bring in lots of sweet little goodies like candy, cookies, and cupcakes, as well as thoughtful “little something” gifts and cards. It’s hard not to like a holiday that involves so much sugar when you have a sweet tooth. Thankfully, we recognize that Valentine’s Day isn’t everyone’s cup of tea. Sometimes planning what you’ll do for your sweetie in honor of Valentine’s day can simply fall by the wayside since many people experience hectic schedules in the beginning of the year. If you’re a gentleman hoping to do something a little different for your Valentine this year, check out these great Valentine’s Day gift ideas from Pacific Merchants! 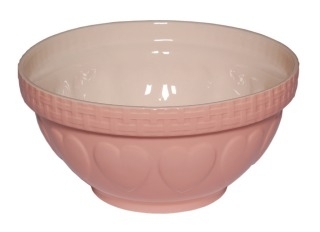 Your Valentine will be able to add a little extra love to their recipes with this Mason Cash Romantic Heart Mixing Bowl. Available in both cream and pink, this mixing bowl measures 11.5″ wide by 5.5″ deep and holds 5.25 quarts. These mixing bowls feature a lip with basketweave detail, as well as raised hearts around the outside of the bowl. Anyone who enjoys cooking and baking would be happy to find this on their counter this February 14th! If your sweetie likes tea, be sure and take a peek at our Price & Kensington five piece red tea set. Available in the perfect “heart red” color, this tea set includes one two-cup tea pot, two red tea pot shaped tea caddies (the perfect place to rest a tea bag), and two red tea (or coffee) mugs. If you’d rather get a larger tea set, we also have our nine piece red tea set available, which includes one six cup red tea pot, four red tea mugs, and four red tea pot shaped tea caddies. Have a honey who likes to cook, but not so sure exactly what to get them? Try one of our gift certificates! Pacific Merchants Gift Certificates are available in whatever denomination you choose, and can be redeemed for whatever your Valentine’s heart desires, whether it be from our Mason Cash line, some of our Acaciaware, or any of our other outstanding products. A little work on your part, and a lot of thought on ours, and your Valentine’s Day will be hassel-free! This entry was posted on Tuesday, January 11th, 2011 at 3:40 pm and is filed under Mason Cash, Price & Kensington. You can follow any responses to this entry through the RSS 2.0 feed. Both comments and pings are currently closed.